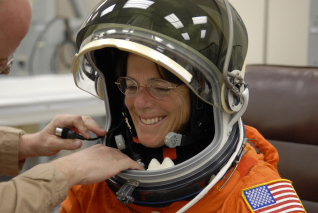 Barbara Morgan: No Limits Follow the 22-year odyssey of Idaho teacher Barbara Morgan to become an astronaut. Barbara Morgan: No Limits is an hour-long documentary chronicling the 23-year odyssey of an Idaho schoolteacher to fly in space. It's a story of perseverance and resolve that has inspired many others to pursue their own goals. STS-118 Mission Specialist Barbara R. Morgan gets the fit of her launch-and-entry suit checked by a tech as part of the prelaunch prep. When McCall, Idaho elementary teacher Barbara Morgan heard President Ronald Reagan announce the Teacher-in-Space program on August 27, 1984, she knew immediately that she would apply. "I shot straight up and said, 'Wow!'" she has said, "Because as teachers, we're always looking for opportunities to bring the world to our classroom." In her application, Morgan stressed her method of active teaching, which meant incorporating her own life into her lessons and getting students out into the field. In order to educate the children about space, she said, she needed to experience it. "I want to get some stardust on me," she wrote. Out of 11,000 applicants, Barbara Morgan was named the runner-up to New Hampshire teacher Christa McAuliffe and trained alongside her. But after McAuliffe's death on the shuttle Challenger in January, 1986, NASA cancelled the Teacher-in-Space program. 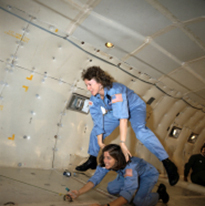 Christa McAuliffe and Barbara Morgan preview microgravity during a special flight aboard NASA's KC-135 "zero gravity" aircraft. "It looked to me personally that Barbara Morgan would never get a chance to fly," said Bill Harwood, a veteran CBS space reporter. But history would dictate another course. Using rare footage, photos and internal documents, as well as interviews with Morgan, her friends, colleagues, students and family, No Limits shows how Barbara became a full-fledged astronaut, and then overcame additional challenges, including the loss the crew of the shuttle Columbia on February 1, 2003. Morgan had been scheduled to be on Columbia's next flight later that year. Her mission was delayed for nearly four more years. But finally, on August 8, 2007, Morgan and the six other members of STS-118 blasted off in the Shuttle Endeavour. During the 13-day mission, Morgan was in charge of all payload and operated a robotic arm to transfer a platform to the International Space Station. She also answered questions from students via satellite, something McAuliffe had also hoped to do. Educator astronaut Barbara Morgan speaks with students during Space Center Houston's "Meet an Astronaut Day." During the mission, NASA was faced with tile damage to the underbelly of the shuttle — an eerie repeat of the situation that had doomed Columbia. Fortunately, the gashes in the tiles were not as deep and the craft returned to earth safely. Since her return, Morgan has retired from NASA and is working for Boise State University, promoting science, technology, engineering and math (STEM) education across the country. From a 32-year old schoolteacher to a 55-year old astronaut, Morgan had finally achieved her dream. "Yes, actually I did get some stardust on me. We all got some stardust on us," she said. Barbara Morgan: No Limits was produced by Marcia Franklin of Idaho Public Television. To follow a timeline of Barbara Morgan's quest to fly in space, visit the film's Web site at http://idahoptv.org/nolimits/. Read Morgan's application to the Teacher in Space Program and watch her videotaped entrance questions. Watch the liftoff of STS-118 and interviews with Morgan in space. © 2015 Idaho Public Television. All Rights Reserved. Text by Marcia Franklin. Photos courtesy of NASA and Kim Shiflett.